For years, videogame developers have enjoyed incorporating all sorts of fearsome beasts into their products. The elaborately badass attack sequences are easy examples. Watching Bahamut, king of the dragons, unload a volley of fiery energy from its fanged maw onto a hapless field of enemies - well, it's just satisfying to behold. Maybe it's the fireworks show of decimation that leaves us wide-eyed, or maybe it's the schadenfreude we feel seeing such a behemoth liquefy a bunch of level 3 imps. But it's just not game designers who get a kick out of breathing life into scaly killing machines. For millennia, artists have been inspired to use mythological beasts in their work. It is subject matter that has endured because of the emotions it evokes in the creator, as well as the audience: Awe. Fear. Fascination that such a horrifying, multi-headed wyvern could exist, if only in our imaginations. Videogames make these experiences more active. In a videogame, you interact with these gnarly monsters you'd otherwise just be observing. In a videogame, the monsters are under your control. Humans dig anything that's big or breathes fire, and games simply continue the phenomenon. Developers and players get a thrill encountering virtual versions of these legendary powerhouses - and get a bigger thrill from having them do the player's bidding. Maybe it's being able to summon a beast to your aid in battle, play as the beast itself, or being strong enough to vanquish the beast completely, but gamers are allowed to subjugate the powerful creatures that have been depicted in the visual arts for centuries. Mesoamerican creator-god Quetzalcoatl, the sweet-voiced, soldier-neutralizing Sirens and Norse lore's moon-devouring wolf, Fenrir, are all summonable in the Final Fantasy series. Vampires, zombies and other tribesmen of the netherworld are hallmarks of Resident Evil and Castlevania. And Lucifer himself appears in last year's adaptation of Dante's Inferno. Depictions of beasts and evil monsters pre-date the modern era, and certainly pre-date videogames. Sculptures, bas reliefs and mosaics from Cerberus to Medusa were found in classical antiquity's palaces and bathhouses. Statues of dragons and phoenixes greet visitors of Beijing's Forbidden City. The Japanese use a giant wooden statue to depict Buddhist deity Bishamonten as a scowling, 28 foot-tall warrior-god in Nara's Todaiji temple, and the Trevi Fountain in Rome includes a faÃ§ade of mermen wrestling hippocampi (horse and sea serpent hybrids) into submission. And the great artists themselves? Many decorated their homes with such iconography, as Francisco Goya did when he painted a gruesome image of the god Saturn eating his own kid. Goya hung it in his dining room. Diane Reilly is an Associate Professor at Indiana University's Henry Radford Hope School of Fine Arts, teaching in the Department of History of Art. She told me that, based on artistic trends, it's understandable that gamers would want to subdue these creatures. 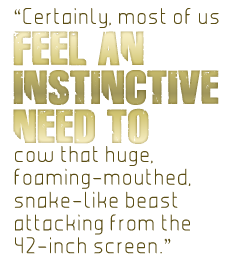 "Certainly, most of us feel an instinctive need to cow that huge, foaming-mouthed, snake-like beast attacking from the 42-inch screen," Reilly says. "Viking artists who carved writhing beasts all around the doors of their stave churches both feared the animals they represented, and respected their powers."